Are you planning to buy a home carpet cleaner? Find out what the different types are, and what type of cleaning tasks they are most suited to do. Compare and take note of the main features of each type. Having all these information helps you make the right choice. There are four fundamental types of home carpet cleaners. The most popular types are regular upright cleaners and portable spot cleaners. A lot of home owners prefer to get a regular upright carpet cleaner for their homes for two main reasons. These machines clean well. They are also priced reasonably. What are the key features of a regular upright carpet cleaner? 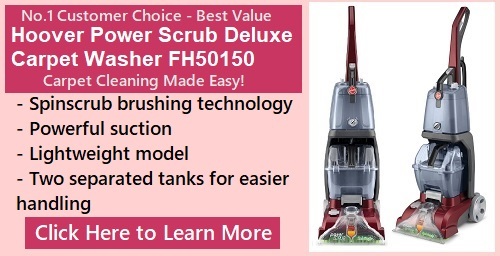 It is powerful enough for cleaning a room or an entire floor. It weighs between 20 and 25 lbs. It measures about 40 inches in height. Its water tank holds about 1 gallon (128 oz) of water. It costs between $150 and $300. It usually comes with a hose attachment and brush-heads for more focused deep cleaning of spots, stairs and upholstery. Who are Regular Upright Cleaners recommended for? If you want to get the best value for your money, check out this type. It is an all-in-one model that does it all – from spots with spills to entire stretches of wall-to-wall carpeting, from stair steps to upholstery. The regular upright cleaner is recommended for people who need to clean a small living space without having to deal with the inconvenience of lugging and storing a heavy and bulky heavy-weight cleaner. Portable spot cleaners are lightweight, compact and easy to store. 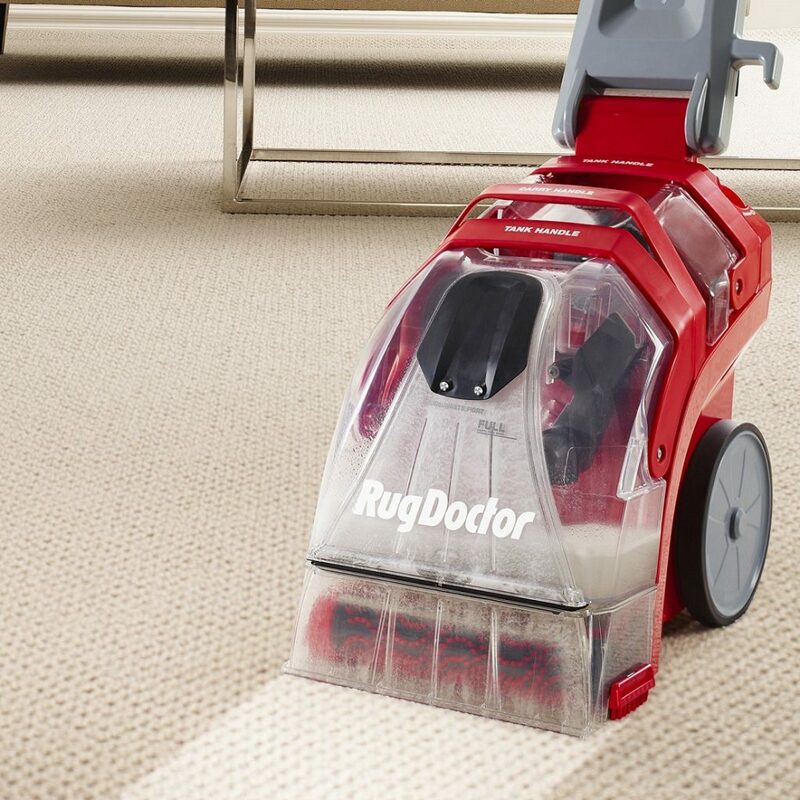 It is ideal for spot cleaning in between serious and more thorough carpet cleaning schedules. What are the key features of a portable spot cleaner? 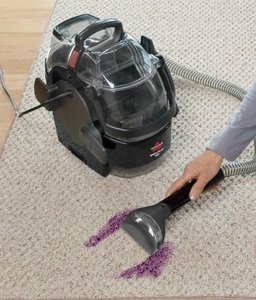 It is ideal for cleaning smaller areas and dealing with simple everyday stains and spillage. It weighs around 10 or 15 lbs. It measures a compact 15” or below in height. Its water tank holds between 30 and 60 oz of water. It costs between $100 and $150. Who are Portable Spot Cleaner Cleaners recommended for? Portable spot cleaners are ideal for home users who simply need a portable machine for removing stains and spots from their car’s interiors, upholstery, stairs, or carpet. They are very popular with pet owners, as our pets can often leave their stains around. Some homes have both upright and portable cleaners. The upright units are used when more extensive cleaning is needed. The small portable cleaner is convenient to take out for clean ups as and when the stains occur. The Lightweight Upright Carpet Cleaner is similar to the regular upright cleaner. However, it generally weighs less and has less power. Because it is lighter in weight, it is easier to maneuver and carry around. What are the key features of a lightweight upright cleaner? It is ideal for shampooing and deep-cleaning carpets and removing pet stains. It weighs between 10 to 16 lbs. It is smaller than a regular upright cleaner, lightweight, and easy to store. Its water tank holds between ½ and ¾ gallon of water. It costs between $90 and $130. Who are Lightweight Upright Carpet Cleaners recommended for? Lightweight Upright Cleaners are ideal for users who need a cleaner for quick, convenient, on-the-go carpet cleaning but do not want the inconvenience of dragging around a heavier cleaner. These cleaners are suitable for homes with limited carpeting, small homes, studio apartments, single rooms and dorm rooms. The professional grade upright deep cleaner is a strong, hardwearing, and well-constructed machine. It has a powerful cleaning capacity. It is also more durable than the other types. These are the ones you see rented at supermarkets. Some home users buy their own outright. 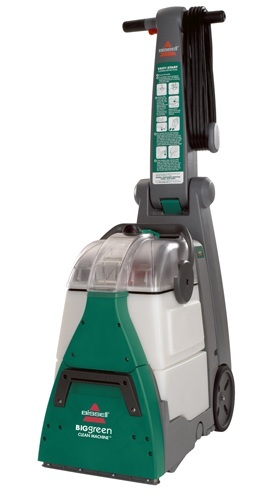 What are the key features of a professional grade upright deep cleaner? It weighs between 30 and 40 lbs. Its tank can easily store between 1.5 to 2 gallons of water. It usually has a two-tank system – one tank to hold clean water, and another to collect the soiled water. It costs between $400 and $500. The professional grade upright deep cleaner is ideal for people who need a heavy-duty cleaner for cleaning multiple floors or a large home with pets. This cleaner is powerful, durable, and tough. Who are Professional Grade Upright Deep Cleaners recommended for? Professional Grade upright cleaners are recommended for home users who like the most high quality and powerful home carpet cleaning machine available. Users report much less problems and a higher level satisfaction with these professional grade cleaners when compared to feedback from users of regular upright carpet cleaners. Some cleaning businesses also purchase these machines for commercial use to offer carpet cleaning services for homes.